The parallel of the above quote to our current administration's blinders-on declarations in defense of their foreign policy set off a burst of knowing laughter from the audience at Frost/Nixon. I came home from seeing this tremendously entertaining and theatrical faction to hear President George W. Bush try to raise his plummeting ratings with a long television interview with Charley Rose, an extremely bright, well-respected but rarely confrontational talk show host. Unlike Frank Langella's fascinating Nixon, Bush didn't collapse in a stunning closeup, as Langella's Nixon does on set designer Christopher Oram's giant digitized overhead grid of screens. But then, except for the state of Vermont's impeachment attempts, Bush remains firmly, if unpopularly, entrenched in the White House and, barring unforseen events, will serve out his term. 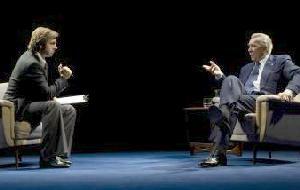 I would have preferred to see Frost/Nixon in a smaller venue like the Donmar Warehouse where it originated. Yet there's something about a big theater that underscores the sense of watching a thoroughly modern Shakespearian tragedy about an awkward and ungainly David becoming a Goliath only to self-destruct into a broken Humpty Dumpty. The Jacobs Theatre where the American production is playing also gives even viewers at the rear of the orchestra and the balcony a close-up look at Nixon's coming apart in the devastating last part of the interview. (Directors might do well to consider making more use of animated projections in large houses where even the less expensive seat cost enough for audiences to deserve more than a long distance glimpse of the actors' faces). As in his hit film, The Queen, Peter Morgan has given us a behind the scenes look at a well publicized event, and used his imagination to create a riveting entertainment. It doesn't matter one whit that you're probably already familiar with the actual details and that you know what happens (in The Queen, Helen Mirren's distant monarch caves in to public's need for a proper royal response to the death of Princess Diana; in Frost/Nixon, Martin Sheen's media savvy Frost nudges a widely televised apology out of Nixon). What makes this play so eminently watchable is the chance to be in on the smartly staged prize fight between two oddly compatible contenders, both of whom are brilliantly interpreted. Given Morgan's highly selective text (no mention of Nixon's penchant for anti-Semitic and other ethnic slurs or the several books that did quite a bit to help mend his damaged reputation) and his imagined additions keep this from laying claim to being a history lesson. Yet it is that imaginary touch that provides a sizzling fresh touch —most notably, the midnight phone call from an inebriated Nixon to Frost that, like a show stopping song in a musical or an outstanding opera aria, has the audience bursting into applause. Anyone looking for a more carefully documented approach to this slice of history will soon be able to read ALL about it in James Reston Junior's long delayed memoir The Conviction of Richard Nixon: The Untold Story of the Frost/Nixon Interviews — its June publication date is a timely tie-in to Reston's role as Frost/Nixon's narrating Greek chorus. However, for sheer theatrical pizzazz, nothing (not even the already contracted for film version) is likely to come close to watching Langella turn Nixon into an almost funny, almost sympathetic and ultimately tragic figure and Sheen play David Frost with the same nuanced flair he brought to the role of Tony Blair in The Queen. As Lizzie Loveridge already pointed out neither actor resembles his character, and it is their ability to embody these men's personalities that makes their performances so enthralling. The major change in the Broadway transfer of the Donmar Warehouse production is that the support cast has been replaced by American actors. Like the British thespians all animate what may sound like a static talking heads play. Besides the already mentioned Kunken as Nixon basher and narrator, Armond Shultz and Remy Auberjonois do excellent work as Frost's handlers. Corey Johnson plays Nixon loyalist Jack Brennan with unwavering devotion. Stephen Rowe is hilariously on target both as the ueber deal maker Swifty Lazar and Mike Wallace. Sonya Walger is a lovely addition as Frost's airplane pickup who later becomes his lover and assistant. It's interesting, and not a little ironic that the same medium that helped Nixon's famous 1952 Checkers speech save his role as Eisenhower's vice-presidential running mate ( the speech countered accusations of a lavish life style with a humble self-portrait of a family man with a clothcoat wearing wife and a dog named Checkers) twenty-five years later helped Frost to come out the winner — and is now sure to make this play a multiple winner of any number of upcoming awards. Running time: One hour fifty five minutes with no intermission From 3/31/07 to 8/19/07; opening 4/22/07. Running Time:1 hour and 55 minutes, with no intermission. I wouldn't want to be a Russian leader. They never know when they are being taped. David Frost's interviews with Richard Nixon had the largest television audience ever for a news interview programme (New York Times). The question on everyone's lips was whether and how Richard Nixon would dodge the questions about the Watergate scandal which had caused his humiliating resignation from the most powerful political job in the world. Would he apologise to the American people? Having had a recent success on television with The Deal, a political drama about Gordon Brown and Tony Blair, Peter Morgan has written his first drama for theatre, Frost/Nixon about the negotiations leading up to the 1977 series of televised interviews. Morgan's play is about how politics and the show business media are in each other's pocket. Both men have their reasons for doing these interviews: Frost to revive his dwindling television career and Nixon for the money and the chance to spin things his way. Peter Morgan's play draws parallels between Nixon and Frost as men -- in a fictionalised telephone conversation, he has a less than sober Nixon phoning Frost to compare notes on how they both were socially looked down upon, Frost by his contemporaries at Cambridge University and Nixon by the stalwarts of the Republican Party. The play documents how Frost's profile is suffering with the cancellation of his Australian series and others, and how he funds the Nixon interview himself, rather than relying on backers. Swifty Lazar (Kerry Shale) is shown as Nixon's agent who presses Frost hard for the best achievable deal and equally hard for his commission from Tricky Dicky. Nixon is protected by Corey Johnson (Jack Brennan) his ex-military Chief of Staff who, passionately loyal, bears the brunt of Nixon's attempt at humour when he talks about some Cubans with CIA training, who he could send into Frost's hotel room. Frost is supported by Jim Reston (Elliot Cowan), his political researcher who is determined to nail Nixon and who eventually gives Frost the means to do exactly that. Reston narrates the play and is as near as it gets to a hero. Frost of course takes the credit, maybe the real reason he was despised by some at Cambridge. John Birt, later Director of the BBC, (Rufus Wright) nervously points out the risks that Frost is taking. We see the rehearsals that Frost's team set up for him in order to brief for Nixon's ability to dodge the questions. Even so, Nixon completely plays Frost in the first interview taking 23 minutes to answer the first question and expertly deflecting Frost with emotion and prayer. The set uses a backdrop of five by five monitors to show close ups which I couldn't see from Row D in the side stalls. Neil Austin's lighting provides excitement and the play is broken up dynamically with lots of side scenes. The acting credits go to Frank Langella's amazing performance. Not like Nixon to look at, his starring role is all the more remarkable. Who will ever be able to forget his asking for a handkerchief to wipe off the perspiration on his upper lip which the viewing public might construe as guilt? He plays a man who thinks his power places him beyond morality. "I'm saying that when the President does it, it's not illegal." Michael Sheen too gives a creditable performance, conveying some of Frost's drawly delivery without going over the top into parody. He is also shown making a move on a woman passenger on his transatlantic flight while Birt snoozes, Frost sleazes, but on the whole Peter Morgan lets Frost off more lightly than he deserves. I'm in two minds about Frost Nixon. While I admire Michael Grandage's slick and fast moving production and the outstanding performances he has elicited from his cast, I am not sure that Peter Morgan has much to say about the events that is new. It is inevitable that this mixture of fact and imagination cannot be anything except supposition. As an example of cheque-book journalism, a reward for misdeeds and lying - Frost was paying Nixon more than $1 million, the Frost Nixon interviews are not really something anyone can be proud of. If you want to watch the interviews again, you might think they should be in the public domain after almost three decades, but no, Frost has his own website and you need to pay.